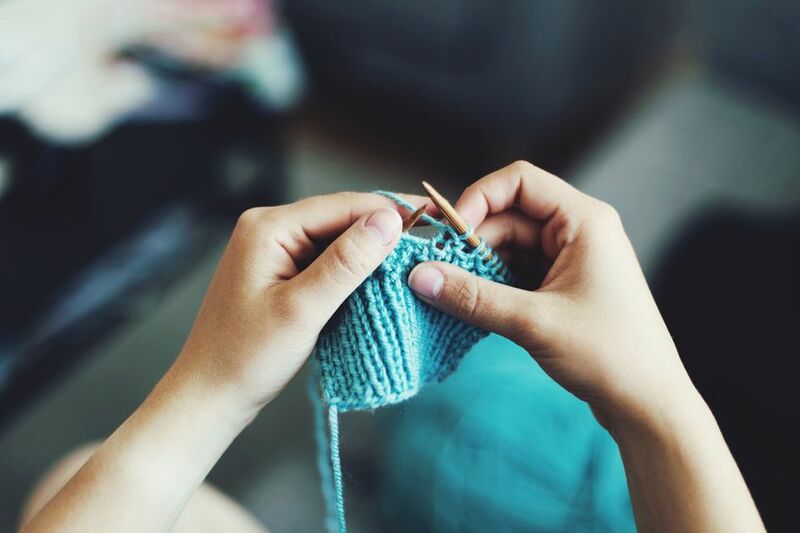 If you've ever read a knitting pattern that aims to be a particular size, you've probably seen a listing for the gauge of the knitting and a note that you should check your gauge before beginning. The way you determine your gauge is by knitting a gauge swatch, and though lots of knitters hate doing it because they'd rather get down to knitting, it's really important to do it if you want to knit things that are the proper size. Knit a swatch that you think will be big enough to give you about 6-inch/15-centimeter square. It doesn't have to be perfect, but most gauge measurements are based on 4-inch/10-centimeter, so you'll want at least that much to work. When you've finished your swatch, bind off and wash it the way you will wash the finished garment, whether that's by hand or machine. (Yes, this is an important step, because yarn behaves differently once water is introduced.) Allow it to dry. Take your finished swatch and lay it out flat on a table or the floor. Pick a point to measure from and use a straight pin to mark that spot if you need help seeing the stitches. Use a tape measure or ruler to mark out four inches/10 cm and count the number of stitches. Use the same process to count the number of rows. Compare these numbers to the numbers listed in your pattern. If you're spot on, congratulations and get to knitting. If you have more stitches per inch than the pattern calls for, that means your stitches are too small. Try again with the next largest sized needle. If you have fewer stitches per inch than the pattern states, your stitches are too big. Make another gauge swatch using the next smaller needle. If your gauge swatch is more than a stitch or two per inch off, it may be that the yarn you've chosen is not a good match for the pattern. Not every yarn can be used for every pattern, so you might need to look for a different pattern that will suit your yarn better. The length measurement is not as critical as the number of stitches per inch on most projects because you can always adjust that by knitting more or fewer rows to suit your needs. It is the number of stitches per inch that plays a key role in sizing unless you are knitting a project from side to side. If you're not concerned about the finished size of your project, go ahead and skip the gauge swatch. Projects like scarves, baby blankets, shawls, and throws don't need to be an exact size, so you can probably get away with skipping this step. If you're making anything that is fitted, from a hat to a baby bootie to a sweater, it pays to take the time to make a gauge swatch so you know your sizing is perfect. As knitters, most of us are pretty passionate about fiber. Consider making gauge swatches as just another way to get to explore yarn and have fun with it. Making a gauge swatch will teach you about the yarn you are working with as well as teaching you more about knitting.